Pigskins, Pumpkins and a Plethera of Projects are sure signs that Autumn has arrived. We are overwhelmed with all the exciting designs we have for autumn, Halloween and Christmas. Some of our favorite fall designs include: Be Ye Thankful from Pineberry Lane. 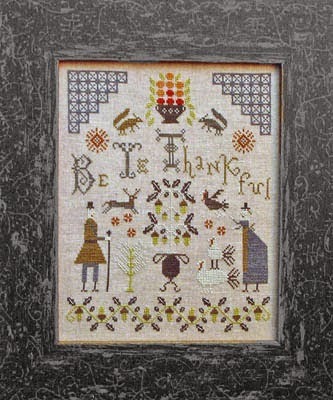 This Thanksgiving design shows pilgrims, turkeys, squirrels and small animals. 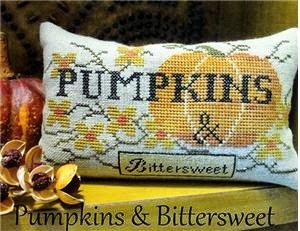 The Scarlett House has two beautiful pumpkin designs. 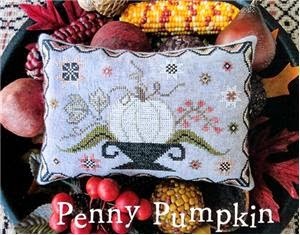 Penny Pumpkin highlights a white pumpkin surrounded by small Autumn motifs while Pumpkins and Bittersweet features a large pumpkin with a spray of bittersweet blossoms. 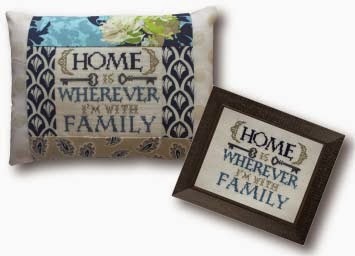 Pine Mountain has several new pillow kits including Home is Wherever I’m With Family. 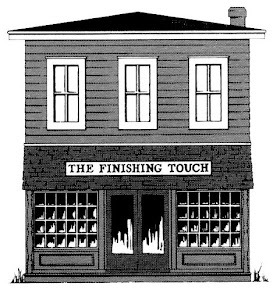 This design comes as a complete kit with everything you need for a completed project. 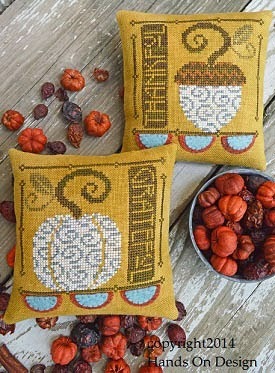 Twice Blessed by Hands On Design shows a stylized pumpkin and acorn adorned with small bits of wool. 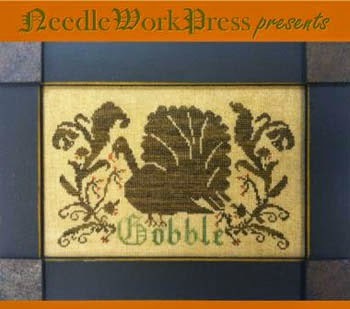 Gobble from Needlework Press features a turkey silhouette, a favorite Thanksgiving symbol, surrounded by fall foliage. Halloween always brings out designs of every level. Flight School from Just Nan has a collection of cute witches and ghosts who seem to be freefalling. 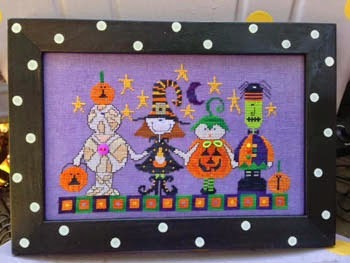 Amy Bruecken presents Halloween Parade, a collection of cute costumed ghouls and goblins stitched on purple linen and embellished with brads and buttons. Very cute! 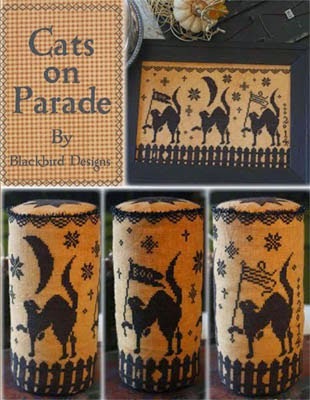 Cats on Parade from Blackbird Designs shows three black cats finished into several different projects in this leaflet. 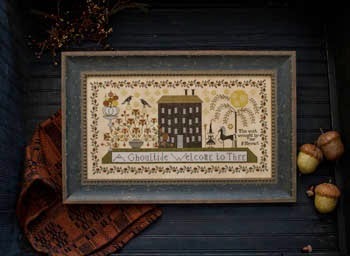 Plum Street Samplers offers A Ghoultide Welcome. 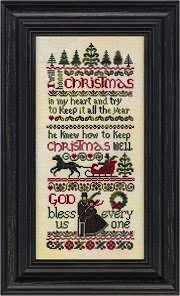 This is a beautifully done sampler which would be a perfect companion to last year’s Yuletide Welcome. 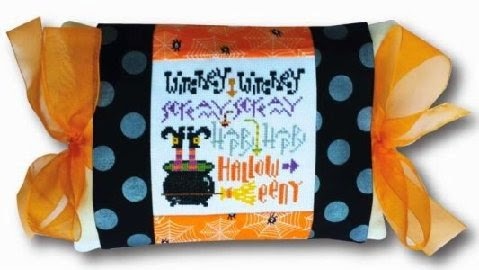 Another Pine Mountain pillow kit called Witchey Witchey is a very cute cauldron holding an upside witch. 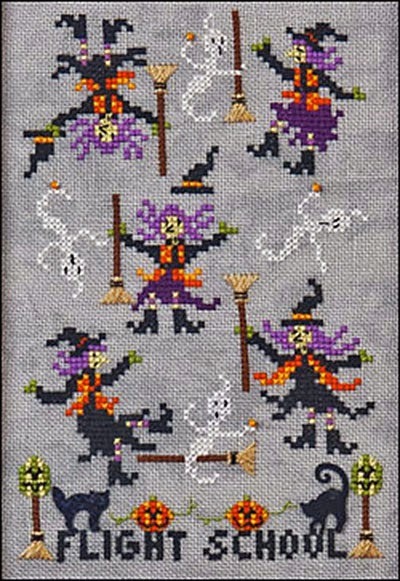 Complete kit that is quick to stitch. Christmas designs are rapidly appearing in the shop and here is a small sample. Lizzie Kate has Reindeer Stocking showing the cutest reindeer ever. Riley is standing on his two back legs covered in red and white stripe stockings and a big smiley face. 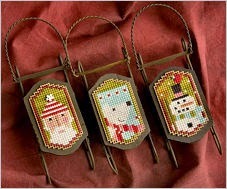 Sled Dudes is a card showing three new ornament designs (polar bear, snowman, Santa) which fit on small sleds. We also have the sled ornaments. Dear Rudolph, also Lizzie Kate, is a complete pillow kit featuring red-nose Rudolph, large stocking and tiny Christmas tree. Ebenezer’s Christmas by Erica Michaels is a beautiful Christmas sampler containing a beautiful holiday verse and horse-drawn sleigh. Country Cottage has introduced a line of 12 ornaments for this holiday season. Dear Santa is the second in the series and how cute it is with its decorated tree. We are anxious to see what comes next. We hope you enjoy seeing some of our new items and invite you to visit our shop to see the remainder. Note for your calendar: If you have items you would like finished for Christmas, our cutoff date is November 1. You can also place orders online by clicking here. Watch the next email for information on an upcoming Christmas Workshop.